Australia could become the latest country to bring in stricter single-use plastic restrictions after the Labor Party announced plans to ban microbeads and some plastic bags if it returns to power in the 2019 federal elections. The measures are as part of a $290-million (£157.61m) plan to improve Australia’s record on plastic pollution and come alongside proposals for a national deposit return scheme (DRS), the appointment of a national waste commissioner, a $60-million (£32.6m) recycling fund and $15 million (£8.15m) of funding to help neighbouring countries clean up the Pacific Ocean. The plans will be contingent on a Labor win in the upcoming federal election, expected sometime in May, over the ruling Liberal party. The party’s environment spokesperson, Tony Burke, criticised the current government’s actions on waste so far, saying that while it had set recycling targets (70 per cent of materials to be recycled and 100 per cent to be recyclable by 2025), it had “offered no pathway as to how they would get there”. A study by charity the Tangaroa Blue Foundation, reported in the Guardian Australia, revealed the results of beach cleans around the coast of the country in 2016 and 2017: over 2.6 million individual pieces of debris were collected, around three quarters of which were plastics. Australia formally joined the Commonwealth Clean Oceans Alliance (CCOA) in July 2018, a coalition of countries led by the UK and Vanuatu aiming to reduce marine plastics pollution. Fiji, Ghana, New Zealand, Kenya, St Lucia and Sri Lanka have also pledged their support. The pressing issue of single-use plastic waste, which came into prominence following David Attenborough’s Blue Planet II series in 2017, looks to be maintaining its position on the environmental agenda, helped by videos that continue to surface of litter-choked coastal waters and wild animals suffocating on plastics – in March, a whale washed up in the Philippines was found to have died after consuming 40 kilogrammes of plastic bags. More countries are beginning to take action. A ban on microbeads (tiny plastic pieces smaller than five millimetres) in cosmetics and personal care products has been in place in the UK since January 2018, and is thought to be one of the world’s strictest such bans. In fact, in 2018 alone, France, Canada, Taiwan, New Zealand, Northern Ireland and Sweden all implemented bans on the miniscule plastic pieces, while a number of other nations proposed similar measures. The European Chemicals Agency has tabled a proposal that could see ‘intentionally added’ microplastics banned from products across the EU by 2020. Single-use plastic bags have also come increasingly under fire, with South Korea implementing a ban in January this year, following in the footsteps of over 50 countries that have either banned or introduced charges for lightweight disposable bags. Individual Australian states and territories have already gone some way towards plastic bag bans of their own, with all except New South Wales having some form of legislation against the use of lightweight plastic bags. Labor said that its national ban would create consistency across the country. The Prime Minister has pledged £61.4 million to tackle marine plastic pollution through a global alliance of Commonwealth states. Prime Minister Theresa May has announced that the government will consider making the plastic bag charge mandatory for all businesses and raising it to 10 pence. 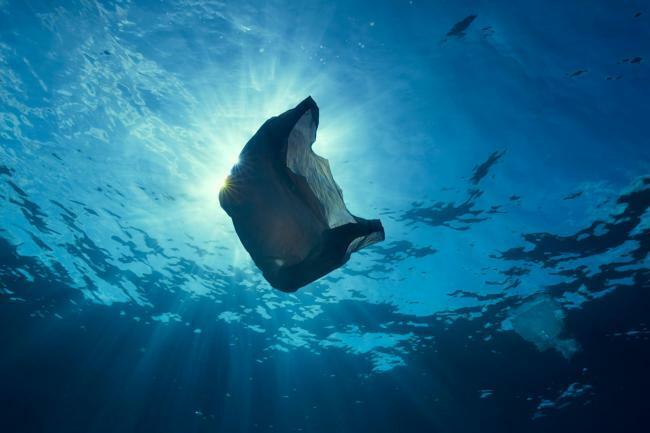 With a new study appearing to show that plastic carrier bag litter on the seabed has fallen as a result of the 5p charge, Chiarina Darrah, Senior Consultant at Eunomia, asks what lessons we can legitimately draw from the data.